by Mirella Kaloglou & Panos Diotis. Are you tired of the same ol' meatballs recipe that you use time and time again? Don't you want to try something different and delicious? We bet you do; and we got you covered. In this post we gathered 8 amazing meatball recipes from around the world: our journey begins in Belgium, then we are off to Brazil, then Mexico, USA, Canada, Vietnam, India and finally back here in Greece. These recipes are guaranteed to make your dinner one to remember! As for the blogs participating in this roundup, we can personally vouch for them. These are accomplished food bloggers with tried and true, awesome recipes. If you never visited any of these blogs before, we bet you'll sign up and follow them once you try any of their recipes (such as these included here). Not only are these recipes different in flavor, but they vary in ingredients as well; are you a fan of beef? Do you prefer turkey? Are you looking for a vegetarian meatball recipe? The roundup covers all. 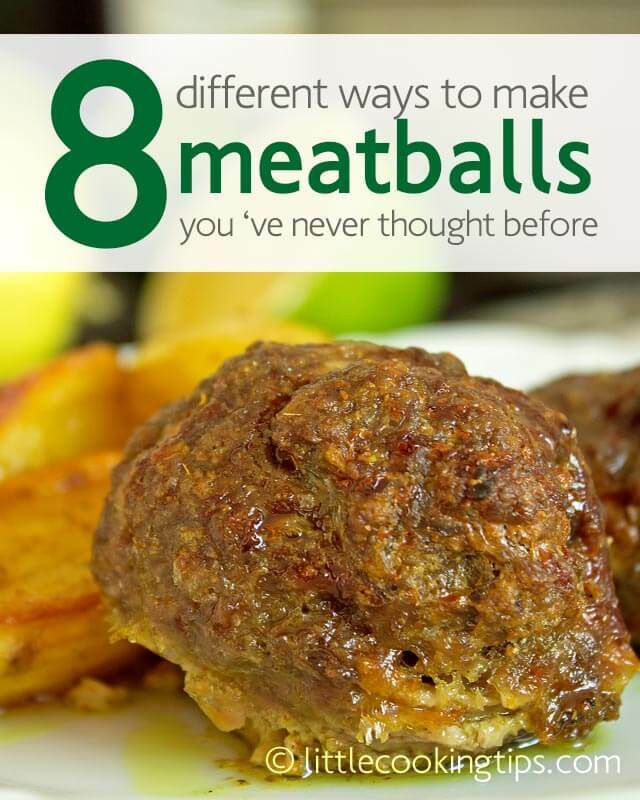 So without further ado, here are 8 the different -and delicious- ways to make meatballs! A classic Belgian dish, with white wine and cream. We fell in love with this dish, the moment we saw it in June's blog. Rich and filling, this is definitely one of the best meatball recipes out there! As Denise puts it, these are meatless meatballs, with a zing! Made from pinto beans, cilantro and parsley and served with warm Mexican salsa (or a BBQ sauce) these meatballs are yummy vegetarian treats, ideal for any occasion when you're having people over. A delicious Mexican soup, made with 3 types of ground meat: lamb, pork and beef (or veal). This is also a great make ahead recipe, as you can prepare the meatballs a day before and easily make the soup the next day! Loved how Karen garnishes this soup with fresh cilantro and bell peppers! Michelle made these orange-glazed meatballs in a slow cooker, but you can also cook them in a classic pot on very low heat. Super delicious, packed with a lot of flavor these meatballs are also perfect as an appetizer in any party! You can enjoy them as a main dish served over rice; the combination is amazing! A healthier option for meatballs, made with ground turkey, that lacks nothing in flavor! These delicious meatballs include thyme, parmesan, lemon zest, and garlic and are baked in the oven. We loved how she incorporated the spinach into the meatballs, increasing their nutritious value; a perfect option if you're having kids! When Caroline says "...I can promise you they will blow your tastebuds away in the flavor department", we knew she means business. These are delicious meatballs with cilantro, chilies, ginger and fish sauce, and are dipped in an awesome sweet and spicy hoisin sauce. Need we say more? This is the ultimate vegan, vegetarian, gluten free meatball recipe! Made with gram flour (chickpea flour), onions, spices such as turmeric, cumin, coriander, chili powder and cooked in a thin coconut milk broth, this is a delicious, flavorful Indian recipe you'll be cooking over and over again! One of our favorite recipes that we had to share in this roundup: fenugreek-scented meatballs with cumin-coriander-turmeric potato wedges. The meatballs are baked on a bed of potatoes in this one sheet pan recipe; the potatoes turn out golden-crisp on the outside and soft on the inside and the meatballs are full of flavor. You really must give this a try! So, as you see, there’s really no reason for you to keep having the same ol’ meatballs again and again, isn’t there? :) Prep your shopping list and give the recipes above a try. They’re all super yummy!